Not much space to do landings, but I think no accidents occured. Depot, very close to the edge. But OK for this time since the wind speed was low. Sceptical guys following one of the flights. 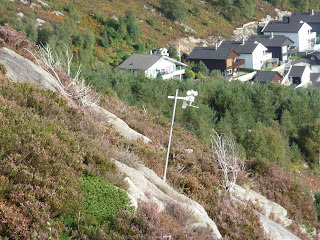 The weather station was placed a little bit down into to the slope to secure good and correct values. This year it was held north of where I live approx. 2 hours away. I get there by driving through 2 under sea tunnels and a gas driven ferry which really can take a lot of cars and trucks. I wanted badly to do well in this competition and I was thinking this was the most important contest this year. So there was nothing wrong with my motivation. But looking at the forecast earlier in the week it looked like it could be a no comp. On Saturday we waited patiently for ca 6 hours before we got legal wind. 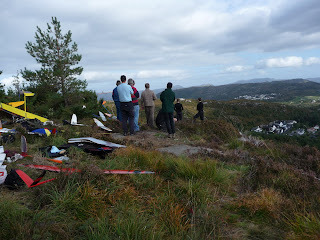 Everybody was keen and we installed the weather station and managed to start ca 15.30. 3 hours later we had 4 rounds and the Championship was secured. Good because we had 6 guys coming from the north of Norway and some other from the south as well. 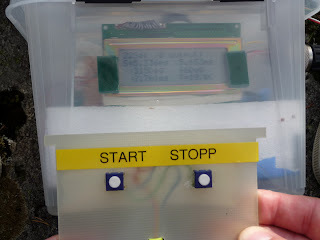 With wind from 3-5m/s times varied from 48 to 97 seconds it was not exactly even conditions but at least by using the weather station the CD had an easy task giving a few reflights. By all means even with this device it remains an outdoor sport with sometimes huge variations, but at least you can understand why you did not manage a good time or even realise that you in fact had some luck if you did a fast time. It is not very difficult to see what is going on when you log every flight. After 4 rounds I was in the lead ahead of Arild M and Bjoern Tore. Some new faces also showed up and the 2 youngsters from Bodoe, Joergen and William flew very well. 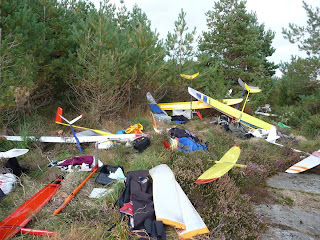 Next day was a bit better and we could start the flying much earlier but we also had to quit early as people had planes to catch. But 5 more rounds made it a good event and it was more even with less thermal influence. Times was between 48 and 65 seconds. Winning times each round was between 48 to 53 seconds. I extended my lead and won ahead of RollaRolf and Bjoern Tore. 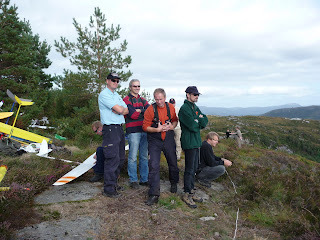 The organizer of the contest was Haugaland RC club and even they did not get as much helpers as expected the competition was a success and also thanks to Kaare who operated the weather station. Hi Espen !! you are defenetly closing a brilliant year. Congratulations from Spain.